'From the Top' is the place to find news, information and expertise from the key influencers at IEP. Entries are from members of the Board, Executive Team or Fellows. When it comes to employment and skills, there are many reasons to be cheerful. The employment rate stands at a record high, and unemployment is at its lowest in nearly 50 years. Yet we face profound challenges too. While employment has risen, far too many people remain stuck in low pay, unable to make ends meet. While unemployment has fallen, there remains a stubbornly persistent disability employment gap, with millions locked out of the labour market. While changes in the world of work mean lifelong learning is more important than ever, 9 million adults lack basic literacy or numeracy, and it is these adults who are least likely to have an employer willing to invest in their skills. The country faces unparalleled levels of uncertainty, and the twists and turns of Brexit seem to be sucking up much attention and generating a great deal of frustration and fury. This event will look beyond Brexit at the crucial employment and skills challenges – now and in the future. Where next for Universal Credit? How can we build a technical education system that is fit for the future? How do we help in-work progression? How do we promote lifelong learning for all? What is the future for devolution? How do we close the disability employment gap? This bursary offer from the Learnng and Work Institute and IEP presents a fantastic opportunity for IEP Members to come along and benefit from the Employment and Skills Convention experience and take part in some great learning, networking and development. Interested in sharing your good practice with leaders from across the skills and employment support sectors? : submit a presentation by 30 April 2019. Call for presentations open. EP, the IEP's dedicated e-bulletin has reached its 150th edition. Each and every week we’ve brought you news from the IEP and on behalf of the employability and skills profession to keep you up to date of important announcements and bring you advice and guidance from our Knowledge Bank. “EP is great way to keep in touch with what’s been happening in sector development. Always very interesting articles and look forward to seeing what other colleagues have been up to in the featured articles”. “As someone that is not part of a large organisation and been in a gap year from full time work, due to long term care of elderly parent, maintaining my membership for when I return to the industry is important. I have done some voluntary career work in Schools and career days in order to keep my development and professional connection. "I intend to study further and come back to the employability sector in the next few months. Having the news letter and being able to apply for work via the news letters and keep in touch is important. Proving what I have done and carrying the letters means I get that recognition that I worked extremely hard for." After 6 years of development that has seen the IEP grow as the voice of Employability Practitioners across the UK, we are delighted to announce an exciting new phase in our Institute’s journey. 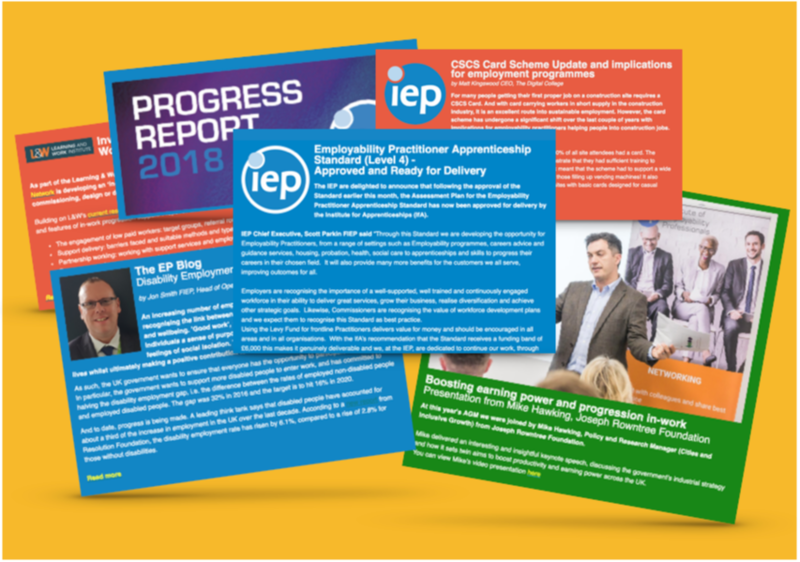 We have created a new Vision for the IEP which sums up what we are here to do ‘Employability Professionals everywhere are the best they can be’. You can see our Vision and Mission Statement here. The Board has reviewed our ambitions for all Members, Corporate Affiliate Partners and Strategic Partners alike and has set our Strategic Goals for 2019, focusing on Growth, Member Support and Professional Business. We will continue to build our networks, extending our reach to include new markets that address employability such as careers and health specialists and further extend our reach into public sector delivery both here in the UK and internationally. You can read our Strategic Plan here. We are reviewing the way we work with all our Strategic Partners. With this in mind, ERSA and the AELP have agreed to stand down as Board Observers and we look forward to building different but equally strong relationships with both organisations, enhancing our work together to deliver even better services and support for all our Members and to fulfil our shared objectives. We are excited to announce that the IEP is moving to new premises with a new registered office in the Old Street area of London. This provides us with a location from which we will be able to establish our identity as an entity in our own right. We are also very pleased to announce the appointment of our new Member Services Co-ordinator, Helen Lee. 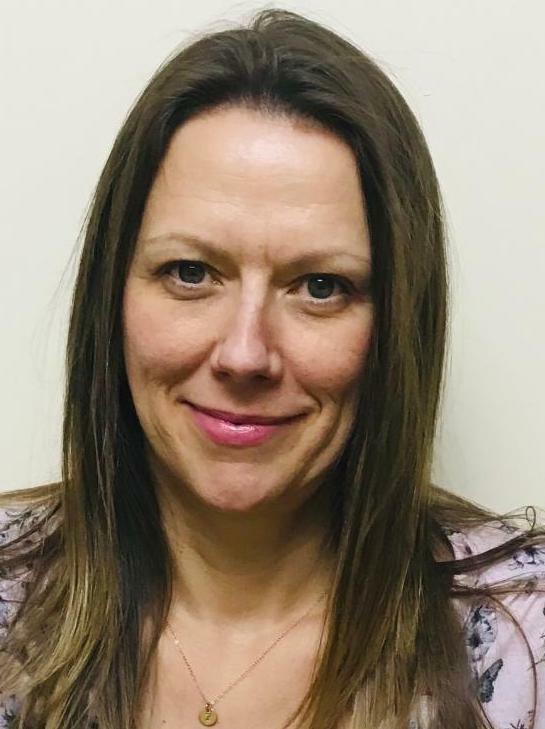 Helen joins us from Working Links and comes with a strong administrative and customer support background and a wealth of experience in Learning and Development. Helen will be a huge asset to the IEP Executive Team and will provide crucial services in engaging with and supporting all of our Members, Board Directors, Corporate Affiliate Partners and Strategic Partners. The IEP has worked tirelessly to establish our credentials as the professional Membership Institute for the employability profession. These new developments illustrate just how far we have come and how much we have developed, strengthening our business partnerships with strategic leads across the wider employability and skills sector and developing an ever-increasing network of like-minded Corporate Affiliate Partners and Strategic Partners from organisations large and small who join the IEP to support our mission of helping the people in our profession to be the best they can be. We would like to thank all of our partners, especially ERSA, who have always supported our aims and objectives and helped us grow into the Institute we are today. We look forward to continuing and reinforcing our relationship with all our partners to meet the needs of our Members and to continue to represent and champion the employability profession overall. Our new address is IEP, 3rd Floor, 86-90 Paul Street, London, EC2A 4NE and the telephone number is 020 3974 2033. Helen has over 25 years’ experience in people focused roles that involve supporting and developing others to reach their potential across a number of industries including Health & Fitness, Recruitment, and Welfare to Work. She has a passion for learning and talent development and a genuine interest in people’s opinions, values and drivers. During her time with Esporta Health & Fitness she worked as a Membership Services Manager, which included identifying innovative ways to identify member’s expectations and needs across all areas of health, fitness and wellbeing and increase overall satisfaction and added value to their membership. She moved from this to a Sales & Marketing Manager role with a local football club responsible for raising the profile of the team within the community, working with local schools and businesses to encourage an active, healthy lifestyle. She then moved into Education Recruitment with Hays supporting local schools in all areas of internal resourcing from needs analysis to assessment and appointment. It was during this time that she decided to specialise in Learning & Talent Development. She spent 3 years working as a Learning & Development Consultant across multiple specialisms within the Hays Recruitment Group including Construction and Property, IT, HR, Health & Social Care, Education, and International, delivering training all across the UK, Europe and UAE. Helen is values driven and this led to her moving from recruitment to welfare to work in 2009 when she joined Working Links as a Learning & Development Business Partner. In this role she designed, delivered and evaluated a number of employability skills and coaching programmes for front line staff using a variety of learning interventions such as eLearning, Online Learning Events, Virtual Classroom, Work Based Learning and traditional classroom sessions. She also developed and implemented the Management & Graduate Development programmes. In 2018 she moved into the role of Learning & Development Manager responsible for the development and implementation of a digital learning and performance improvement strategy. Helen strongly believes in continual growth and development both professionally and personally. In her spare time she enjoys keeping active and is a qualified TaeKwonDo Instructor holding a 2nd Dan Black Belt. Following a number of successful Networking Events in Manchester, Newport, Bolton, Birmingham, Sheffield and London, the IEP are delighted to be running our first ever Networking Event in Durham. Entitled ‘Using digital technology to achieve better delivery, learning and assessment’, the event is kindly hosted by Education Development Trust and sponsored by The Digital College and takes place on 9th April at Ramside Park, Carville, Durham. Despite the growth of online learning, digital assessment remains a much under-utilised area that could make learning and qualifications much more accessible and help answer the country’s skills gap. We are delighted to have Matt Kingswood, CEO of IEP Corporate Affiliate Partner The Digital College, presenting on this issue, discussing the challenges and options available today in our ever growing digital world. Also presenting at the event will be Scott Parkin FIEP to provide an update on the IEP’s progress and the Education Development Trust who joined the IEP as Corporate Affiliate Partners in 2018. Education Development Trust have been a leading careers service provider in the UK for over 20 years, bridging the gap between education, training and employment. They have been delivering the National Careers Service in the North East on behalf of the UK government since 2004. Education Development Trust's presentation will focus on how digital tools are embedded in all aspects of their contract delivery to ensure they are meeting the needs of theircustomers and delivering full contract compliance. Attendees will gain an insight into the challenges of using digital tools with customers who are not digitally able and how this can be overcome. The event offers ample opportunity to network with colleagues and peers and build new contacts with other IEP members and the wider Employability profession. Alongside this great learning content there will be refreshments provided. The IEP is delighted to welcome Gareth Matthews FIEP as our latest Fellow. Gareth is an experienced, passionate and innovative leader within the employment related sector. His contribution to the sector was recognised in 2014 with an ERSA Life Time Achievers Award and as a ‘Community Champion’ by the Prime Minister for his regeneration work in Rhyl. Gareth commenced his career with DWP, working in a wide range of operational and business development roles moving to the private sector after 25 years. Since 2000 Gareth has held Director roles with Working Links and Serco, having helped both to enter the employability sector. He is currently a Director for Itec Skills and Employment and Founder/ Non-Executive for Rhyl City Strategy. Speaking of his Fellowship, Gareth said ‘I am passionate about the personal development of people within the employability sector and I am delighted to see some of my former mentees achieving IEP Fellow status, most before me. I look forward to playing an active role in the development of the IEP, particularly the personal development of its Members’. Learning and skills play a central role in driving economic growth, promoting social justice and supporting inclusive communities. However, the UK’s skills base has long lagged that of comparator countries and over the last decade the rate of improvement in the UK’s skills base has stalled. This is the result of cuts in public funding for adult skills, alongside falling employer investment in skills. Learning and Work Institute’s report 2030 vision: Skills for economic growth and social justice shows that as a result the UK is likely to fall further back in the international league tables by 2030. The skills profile will improve on current trends - with the proportion of adults qualified below GCSE-equivalent level falling from 26% to 21% and the proportion of adults qualified at least to degree level rising from 38% to 43%. This will hold back economic growth and social justice and runs the risk of the UK going backwards whilst other countries go forwards. This is ever more important for the UK’s future prosperity as it leaves the EU. Learning and Work Institute has set out a higher ambition for the UK which would involve making sure more people have functional literacy and numeracy and intermediate qualifications. · 1.8 million to achieve level 3 (A Level equivalent) qualifications. This would boost our economy by £20 billion per year and help another 200k people into work. It would require extra investment of £1.9 billion per year and reversing the falls in the number of adults improving their skills each year seen since 2010. Robert Halfon MP, chair of the Education Select Committee said: “Education is a ladder of opportunity that should give everyone, no matter what their background, the chance to climb to the jobs, security and prosperity waiting for them at the top. Skills, apprenticeships, and adult education are vital rungs on this ladder. Yet, around nine million of all working aged adults in England have low basic skills and over a third of workers in England do not hold suitable qualifications for the jobs they do. “This skills problem is a social justice issue. Our most disadvantaged individuals pay the highest price for low skills but also have the most to gain from up-skilling their way out of deprivation. I am very grateful to the Learning and Work Institute for their longstanding commitment to achieve social justice through education, and I am pleased to support them with the launch of their 2030 Vision report." Don’t miss this chance to attend the Employment and Skills Convention 2019 for FREE! Learning and Work Institute, in association with the IEP, are providing bursaries for three IEP Members to attend the Employment and Skills Convention FREE of charge. present cutting-edge research on employment and skills policy. The aim of the IEP Bursary is to provide an opportunity for sector Practitioners who don’t ordinarily get the opportunity to attend industry Conferences to benefit from the Employment and Skills Convention experience. We hope it will provide a beneficial learning, networking and developmental opportunity. The IEP Bursary includes a full delegate package at the Convention, and a special Certificate which will be presented to the winners on the day. IEP Members wishing to apply for the Bursary can enter by writing a submission, under the title of: ‘Why I should attend the Employment and Skills Convention, and how this will benefit my professional development’. Entries must be a maximum of 500 words in length and be submitted in Microsoft Word format. Entrants must also include their full name, job title, employer’s name, e-mail address, contact phone number, and IEP designation (AIEP or MIEP). • Entries must be received by e-mail to scott.parkin@iemployability.org by 12.00noon on Friday 26th April 2019. Please refer to “IEP Bursary” in the subject line. The Bursary is open to any current AIEP or MIEP Member (Fellows are excluded). Late entries will not be considered. Entries will be judged by a panel from the IEP and Learning and Work Institute. All entrants will be notified of the outcome of the competition as soon after the closing date as possible. The panel’s decision will be final, and no correspondence regarding the outcome will be considered. Bursaries must be taken by the winning entrants and are non-transferable. No alternate prize / cash alternative is available. The Bursary excludes travel to and from the Convention venue, the cost of which will need to be covered by the winners, or their employers. The IEP were pleased to hold our first ever Networking Event in Wales entitled ‘First Things First, the whole approach to helping people into Employment’. Kindly hosted by The Salvation Army Employment Plus and sponsored by ITEC Skills and Employment one of Wales’ leading providers, attendees heard from Samantha Elwick from Salvation Army Employment Plus who gave an overview of the work in Newport and the specific needs of participants who experience difficulties in learning including homelessness, lack of basic skills, mental health and ways to support and empower people to change their circumstances. Also presenting was John Hallam, Programme Manager from Maindee Unlimited CIO who spoke about the ways Employment Plus have worked with Maindee Unlimited as a community project in the area of paid placement opportunities and the impact on those participants involved. The main presentations were followed by networking and refreshments kindly sponsored by ITEC Skills and Employment and a few words from their own Gareth Matthews FIEP and his colleagues who spoke about their work in Wales and making a difference to the IEP Membership in Wales going forward. Scott Parkin FIEP, IEP Chief Executive said “This event follows a successful Fellows Dinner held in Cardiff last last year and we were delighted to welcome Gower College Swansea as our latest Corporate Affiliate Partners. We are very much committed to building our network in Wales, strengthening our presence amongst our Membership there and to bring new learning and networking opportunities to employability professionals over the coming months. Rebecca Keating delivers an interesting session on the history of the Salvation Army in the UK and demonstrates how relevant its work is today, along with its mission, as it was over 100 years ago. Samantha Elwick describes how the Salvation Army in Newport support a 'First Things First' principle when assisting people in Newport. Some great practice to be shared and fabulous to hear a lot of very positive results. John Hallam discusses the need for economic and social regeneration in the area of Maindee in Newport. He describes the community interventions that are taking place and what still needs to be done. It is amazing what a community can do with strong leadership and a great deal of will! Great presentation from @ITECSkills on their social enterprise in Newport offering people the chance to gain skills and move forward in their search for learning and work. The food they produced for the event was excellent and we are very grateful for their support. Founded in 1991, the JGA Group (JGA) is an Ofsted graded “Good” independent learning provider specialising in the management and delivery of apprenticeships and Adult Learning programmes, including Advanced Learning Loans and Traineeships, primarily in London and the South East, but with some national provision. As an existing End Point Assessment Organisation, a key member of both the Career Development Institute and Institute of Employability Professionals, and with a strong history of providing careers and employability programmes, we are well placed to become the preferred End Point Assessment Organisation (EPAO) for the brand new Level 4 Employability Practitioner Apprenticeship Standard launched last week. We are looking for like-minded people to join us in the exciting journey to providing comprehensive end point assessments and associated materials as well as advice and guidance to support training providers and learners throughout the life of their apprenticeship programme. Our End Point Assessors will hold, or be working towards, an accredited Assessor Qualification and will have experience of working in the Careers/Employability sector in some capacity. We will provide accredited EPA training and, as we believe this Standard will be very popular nationally, are looking for suitable candidates from across the Country.